The MRC 8000 incorporates numerous refinements over its 10½ MRC 7000™ sibling, including a larger 12 inch recording area; an advanced platen assembly which eliminates slide wire feedback for improved reliability; as well as the incorporation of optional isolated 4–20mA outputs to provide the highest resolution and accuracy available in a recorder of this type. The MRC 8000 is offered in two versions: a basic recorder and a recording controller. Both may be specified as either single pen or dual pen units. 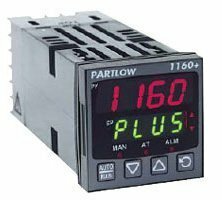 Each version is capable of measuring, recording and displaying temperature, pressure, level, flow and other process variables. The MRC 8000 includes isolated universal inputs and a list of optional capabilities including: transmitter power supply, 5A relay outputs, auxiliary inputs for remote setpoints, RS-485 communications, door lock and NEMA 4X enclosure.